I am proud to convey to you that two of my paintings are showcased in Acrylic Innovation: Styles and Techniques Featuring 64 Visionary Artists, a survey of current approaches to acrylic painting by Nancy Reyner. This fantastic book is very much like a sourcebook — it is geared toward helping artists find new ideas, approaches, and techniques for paintings. Acrylic Innovation is also an eye-opening account of just how vast and varied painting has become, in subject matter and technique. There’s even room for nonobjective, nonrepresentational artists. Throughout Acrylic Innovation, as Ms. Reyner offers examples of paintings that represent a given approach, she complements these with a discussion of featured techniques on the facing page. My paintings are featured in two different places in this book. First, on page 82, under the banner Variations on Confronting the Viewer, you’ll find Where Is Gibarian?, a maximal painting I produced in 2008. 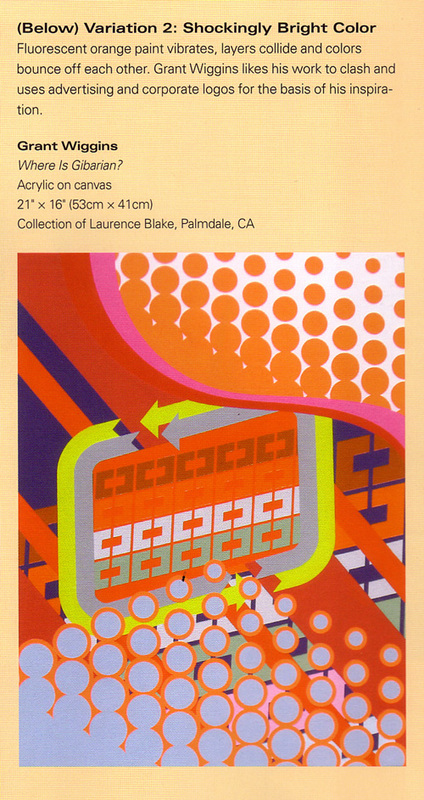 The supporting caption, titled Variation 2: Shockingly Bright Color reads, “Fluorescent orange paint vibrates, layers collide and colors bounce off each other. Grant Wiggins likes his work to clash and uses advertising and corporate logos for the basis of his inspiration.” I couldn’t have said it better myself. Elsewhere, in the Minimal section, on page 134, under the banner Variations on a Singular Note, you will find Spaceloop Two, another painting from 2008. 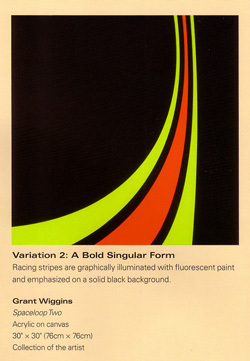 “Racing stripes are graphically illuminated with fluorescent paint and emphasized on a solid black background,” Ms. Reyner writes. I invite you to learn more about the inspiration for this painting in a March 2008 blog post. For me, it is a massive honor to be showing my work with so many remarkably talented contemporary artists. I’m in very good company. Likewise, it has been a pleasure to work with Ms. Reyner on lending images of my work to her book. This book was just released on Amazon.com, and seems to be selling quite well. I wish Ms. Reyner the best of success with her book.